Danilo Chacon behind the hot line at The Eatery. Danilo Chacon learned to cook in his grandmother’s kitchen, but he wasn’t exactly invited in. “My grandmother had 20 children, every one of them girls,” he said, recalling his childhood in the small city of El Encino, Guatemala. Danilo said that when he was young, he’d often drift, entranced, into the massive kitchen, which bustled with his female relatives. “I got kicked out every time,” he said, grinning at the memory. “I wasn’t allowed in it because I was a man, and they’re not really allowed to do things in there.” But as a young kid interested in cooking who ended up with 19 aunts, he was bound to pick up something. 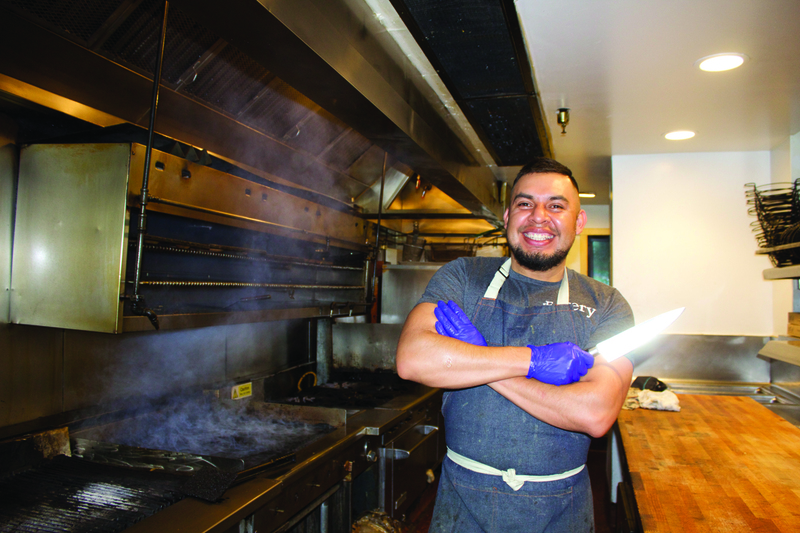 As Chacon walked around the kitchen of The Eatery in Mammoth, where he currently works as a cook, he gestured to the entire dish room and hot line, demonstrating the size of that childhood kitchen on the property where his family grew coffee and raised livestock. He says it was a little like Bishop, actually. “I was a ranch boy,” working with his family harvesting produce, he said. He probably spent more time out in the fields than in that big kitchen, because that’s what he was expected to do, but he always wound up back there sooner or later. When Chacon was 13 years old, he moved with his mother to South Central, in Los Angeles. He can pinpoint a scene in the film ‘Straight Outta Compton” where gangsters on motorcycles pop wheelies through his old neighborhood. He didn’t like the city. He started coming to the Eastern Sierra when he was in high school—one of his aunts ended up working at Double Eagle resort, and Chacon decided he’d teach snowboarding at June Mountain. When he eventually moved up to the mountains permanently after high school, he needed to get to work, and though he’d once considered going to school to teach mathematics, cooking was always nagging at him. His first and favorite memory of a delicious meal, he said, was his grandmother’s Guatemalan tamales (not your familiar Mexican tamale, but a banana leaf-wrapped delicacy made with a salsa containing pumpkin and sesame seeds). He still hasn’t perfected the recipe. “Not yet, but I will,” he says firmly. “It’s different when it’s your grandma’s food. You have to rise up to that level.” His grandma passed away years ago, and since she never really condoned his being in the kitchen, he’s now working out the kinks himself (for the record, his mom loves that he ended up being a cook). Chacon ended up landing a job at the Chinese restaurant Red Lantern, which was opened by Dipna Rado, who now works as a professor of culinary arts at Texas Tech. He went straight to the line, starting out as a garde manger, preparing appetizers, salads and desserts. After stints at a few other restaurants in town (Gomez’s, Rafters), Chacon landed at The Eatery, where he’s been for about two years. He’s perpetually grinning from behind the hot line in the evenings, where he pulls a cheerful second shift after parking cars at Mammoth Mountain in the mornings. During busy weeks, he usually has “about a half a day off,” every seven days. It’s a busy schedule, but he hustles the best he can during the winter. He doesn’t spend too much time going out after work—not least because he usually puts in a 14-hour day. His dream, he says, is to buy a house near Mammoth, maybe in Crowley Lake where he might be able to grow a vegetable garden. His fondness for the food he cooks (the menu is designed by chef Brandon Brocia), comes through if you catch him when it’s slow—he’ll stroll up to the cash register to talk about what’s fresh in Brocia’s stead.